Two years shy of its closure, four questions linger on the future of the Rio Grande shelter. Scenes like the above are commonplace around the downtown shelter’s perimeter. Vickie Childers, a 65-year-old homeless woman whose blue dress complements her dyed cobalt hair, points with her eyes to a man slouched forward like he's fallen asleep mid-stride. "Noodling," she says openly to a few friends who are sitting on camping chairs near the corner of 300 South and Rio Grande Street. Noodling. It's a term they use to describe people who, high on spice, go limp and struggle to keep from toppling face-first onto the asphalt. "I've seen people kiss the ground standing up," says Nicki, a homeless woman from Colorado, who asked that her last name be withheld. The prevalence of the synthetic drug has earned a segment of the road nicknames: "Spice Alley" and "Spiceland," denizens say. Childers won't touch it. In fact, she hopes she and her 31-year-old daughter, who suffers from mental illness, will be in housing within the year, away from the madness of the streets. The milieu at Rio Grande is startling—its thriving, patent drug market; its sidewalks littered with trash, spent needles and human waste; the perennial reports of violence and overdoses. It's no wonder elected leaders—from the city and county mayors, to the sheriff, to the speaker of the House—deem the situation unacceptable and untenable. And so, in July 2019, officials expect The Road Home to be closed and the streets around it transformed. Two years will allow enough time to build three smaller resource centers (two in Salt Lake City, one in South Salt Lake) and kick-start robust programming that focuses on prevention and rehousing. It's the change businesses and property owners have been demanding. But for the communities who are anticipating those new shelters, the next 24 months could look like a runaway freight train. All the while, neighbors, taxpayers and the homeless alike continue to ask what leaders optimistically envision. What will the new shelters look like? Here's what they'll tell you the new shelters won't look like: Rio Grande Street. While the city, county and state prepare to close The Road Home and scatter homeless services through the city and county, leaders are fighting a narrative that the new shelters will emulate its dysfunctional predecessor. The design and programming in the planned facilities could play a deciding role in whether that bears out. Last year, local firm Architectural Nexus was contracted by Salt Lake County to draft architectural programming for three homeless service facilities. Among the tasks were determining space requirements, building forms and lot size. "The big move is that there will be no outside queuing," says Holli Adams, a principal at Architectural Nexus in charge of civic design. The line of people waiting outside The Road Home to secure a bed for the night is a target for drug peddlers who intermingle with those in need of services. But without a queue, dealers simply won't blend in. From the outside, the shelters—likely to be three stories, Adams says—will be smaller than an average three-story apartment building. Each facility will house about a quarter of The Road Home's 1,000-plus population. "They should blend in with any neighborhood," Adams says. "They shouldn't scream 'institutional' and look like a correctional facility. It should be identified as a home and something that people are used to seeing in their neighborhood." Sloping the roofs, for example, and installing residential windows and siding could be the difference between a stale government building and a warm place where people temporarily live. Inside, the plan is to establish a thorough intake system. "It's not like you just walk up to the front door and they stick you in a bed," Adams says. "Before they allow you to enter the facility, seek a bed or get a meal, there is a screening process—a search process in some instances. There is a hygiene process." Clients might be asked to pass their belongings through an oven-like device called a hot box, designed to kill hitching bedbugs. Some of the facilities will offer small specialized rooms for those who work graveyard shifts and need a place to sleep during the day or require specialized medical equipment at night, or safe spaces for transgender individuals. How much will the new system cost? Building three new structures, implementing a voucher program and deploying roving medical services eats money—and a lot of it. But once the walls are erected and the programs are established, ongoing operational costs should be manageable: Less than $80,000 once you subtract state dollars, private donations and tax credits, according to a county report. The Department of Workforce Services drafted a preliminary budget for the county that estimated more than $72.4 million in one-time capital costs. The most expensive line-item from that pot of cash is an estimated $40.6 million allocated to building the new facilities. The same report estimates annual expenses to top $15.7 million. Those numbers, however, are offset partially by money from the state, donor contributions and federal tax credits. After those are subtracted, the estimated gap is about $77,000 annually and about $13.6 million in one-time starting costs. More than $2.2 million would be set aside for motel vouchers, $1.9 million for the Midvale family shelter and $480,000 for contingency beds, as well. DWS Director of Housing and Community Development Division Jonathan Hardy stresses that the analysis is preliminary and that some of the costs will already need to be adjusted. The Road Home, for instance, is relocating homeless families from its downtown facility this month. "Rather than getting hotels, we upped our rapid rehousing program to get them placed into housing," he says. "We've been able to do that probably much cheaper than $1.7 million" that was estimated for family motel vouchers. 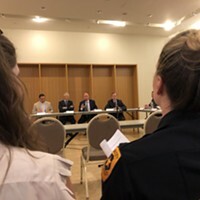 A large chunk of money to the tune of $28 million in one-time costs and $2.6 million in ongoing costs is for housing—a component of homeless services officials such as Salt Lake County Mayor Ben McAdams have repeatedly said are vital in the new model. What do homeless people think of the new model? Much like the factors that cause homelessness, the opinions of people experiencing it aren't singular. Members of the small clique of homeless folks who spoke to City Weekly last Friday have an ambivalent relationship with The Road Home. Drugs and the misery that rides in its wake is reprehensible, they say. Michael, a homeless man from Price who declined to give his last name, rattles from memory a list of deaths and violence he's witnessed. "There was a death that occurred out here the other day," he says. "There was a body lying in the street for a good hour in the sun. The police came, but they didn't cover him. It was very traumatic." Walking to the shelter for the first time about six months ago, Nicki tried to shield her 6-year-old daughter from commonplace sights of the Block. "I started crying," she says. 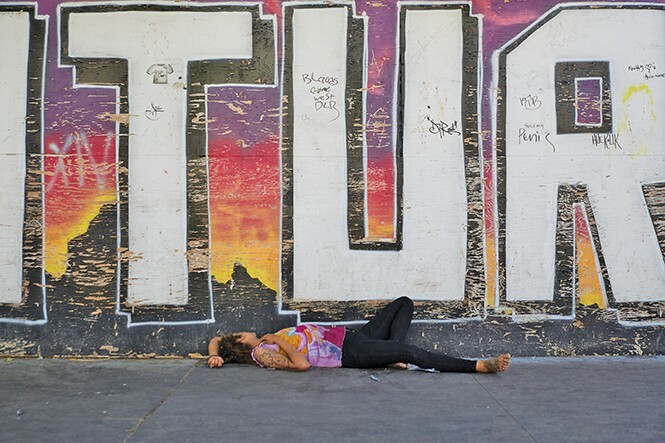 "I had to come up with interesting explanations why people were taking naps on the sidewalk." Michael says he's concerned about getting to and from town if he's sleeping in a shelter miles away. And the milling that happens outside the current shelter could be moved to public transportation. "You've got the library down here. You've got a lot of services in the downtown area," he says. Proximity to public transportation was a key criterion for the committee that picked the new homeless resource center sites, and the preliminary budget estimates a need of $250,000 annually to pay for bus and Trax tickets plus possible shuttle service. Havoc aside, Michael, Nicki and Childers speak glowingly of many Road Home staffers and support its mission. A Road Home bed, Childers notes, is preferable to the unforgiving ground outside. "I think the idea of the shelter is a good thing. Some people mistreat it," she says. As for whether the new shelters will become "mistreated," devolving the surrounding environment into another mess, no one is sure what to expect. "This one didn't look like this at one point either," Nicki says. 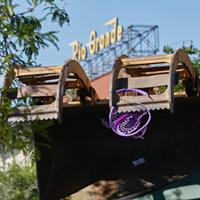 What will become of the property on Rio Grande? This question lingers for now. Shelter the Homeless Executive Director Janell Fluckiger did not respond to City Weekly's emails or phone calls seeking comment. In the remaining two years, her group has the potential to dramatically change that area of Salt Lake City—an outcome players such as the Pioneer Park Coalition eagerly await. Expected is that Shelter the Homeless will sell the land and pump the proceeds back into homeless services. Unknown is what will be built in The Road Home's footprint. 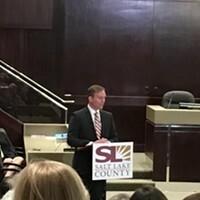 Noting issues with proposed homeless shelter, McAdams delivers State of the County address. Some 800 individuals now have access to behavioral health medical coverage, McAdams said.